1 tablespoon milk plus 1 tsp. Bake 30 min. or until toothpick inserted in centers comes out clean. Immediately run small spatula around cakes in pans. 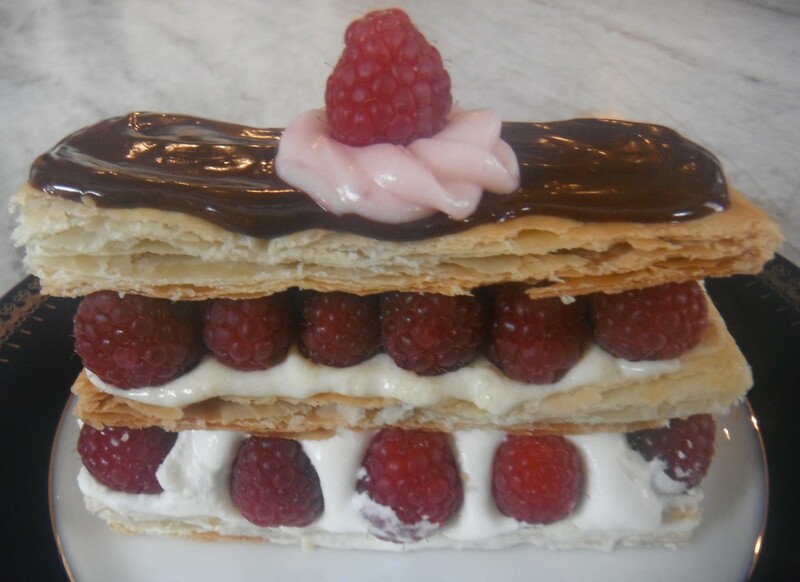 Cool cakes in pans 15 min. ; remove from pans to wire racks. Cool completely. Mix first five ingredients in saucepan. Cook on medium heat for about 12 minutes or until thickened and golden. Stir in coconut and nuts. Cream butter. Add milk slowly and beat until smooth. Add the chocolate and beat well. Add vanilla and powdered sugar on low and gradually increase speed. Beat until creamy. Fill in between the layers and top layer with Macadamia-Coconut frosting. Frost the sides with the buttercream. Optional , garnish with caramelized dipped macadamia nuts. Preheat oven to 350 degrees. Line 2 (12)count muffin tins with cupcake liners. In a bowl combine the flour, salt and baking powder; whisk. In a bowl of a mixer cream together the sugar and butter. Add egg one at a time until well combined. Add the lemon zest and vanilla; blend. Alternately add the flour and milk , ending with the flour. Blend just until combined. Fold in coconut and blueberries. Scoop evenly into the 24 muffin cups. Bake for about 20 minutes or until a toothpick comes out clean when inserted into the center. Remove from oven . Allow to cool 5 minutes in pan then place on wire rack to cool completely. Whisk ingredients together until completely mix together. Poke wholes into the tops of the cupcakes using a toothpick. Brush the lemon glaze on the tops of the cupcakes; set aside. In a heat proof bowl whisk together all the ingredients except the butter. Place bowl over simmering water making sure bottom of bowl doesn’t touch the water,stirring constantly over simmering water until thickened. remove from heat and stir in butter until melted. Set aside to cool completely. In a bowl of a mixer combine the cream cheese and butter; cream until fluffy and combined. Add the zest and cooled melted chocolate; blend. Add the vanilla and milk; blend. Beat in slowly the powdered sugar until well combined and fluffy. Using a pastry bag fitted with a large plain tip, pipe the frosting evenly on each cupcake. 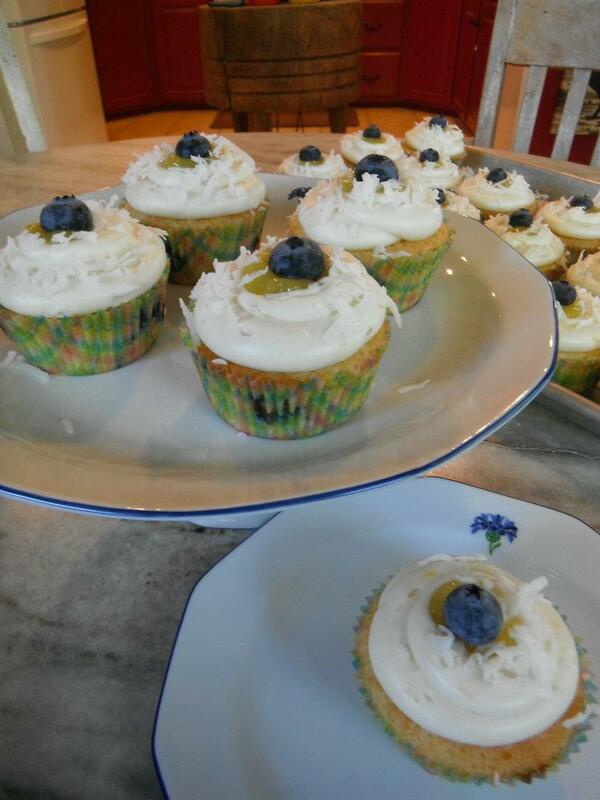 Using a small spoon make a divot on the top of each cupcake and place a dollop of lemon curd in the divots; Top each cupcake with a fresh blueberry and sprinkle with coconut. In medium bowl place flour, baking powder, salt and coconut and whisk together. Set aside. In a large bowl cream butter. Gradually add sugar, scraping bowl. Beat 2 minutes . Add egg whites one at a time, beating well after each addition. Beat in vanilla and zest. Add milk and flour mixture alternately to butter sugar mixture. Mix until just blended. Fill liners 2/3 full and bake about 18-20 minutes or until center comes clean when toothpick is inserted into center. Cool slightly. While cupcakes are still in pans poke holes in tops of cupcakes using a toothpick. Combine ingredients. Remove paper liners from cupcakes and place in dessert cups or plates. Using a teaspoon measure, slowly pour 2 tsp of soaking liquid on each cupcake. Place covered in refrigerator for at least an hour or overnight. Combine all ingredients and whip until stiff. 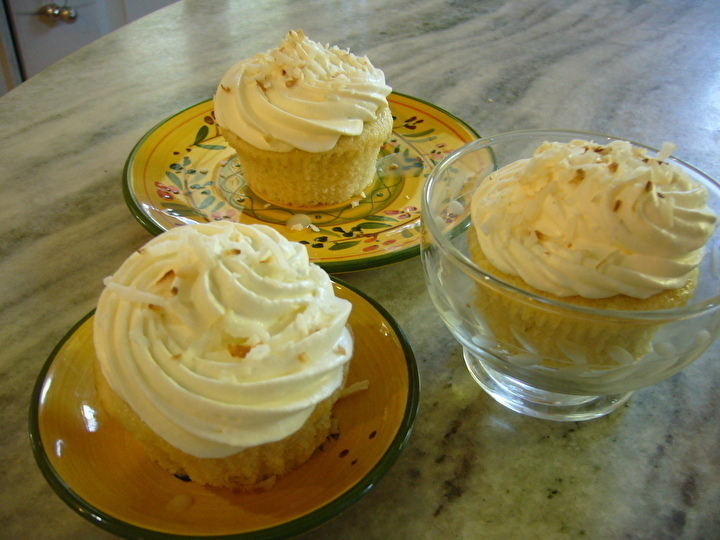 Pipe onto each cupcake and garnish with toasted coconut. 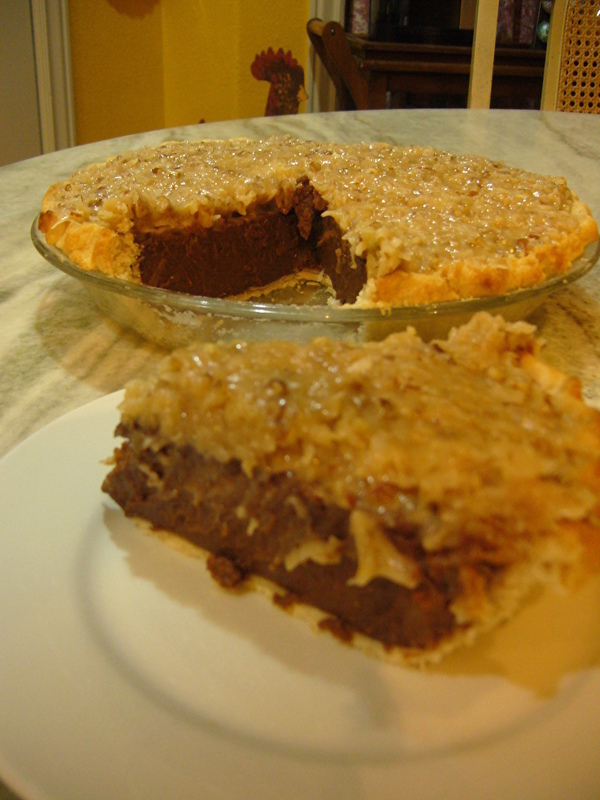 To making the filling , add to a saucepan the milk, sugar, cornstarch, butter and chopped chocolate. 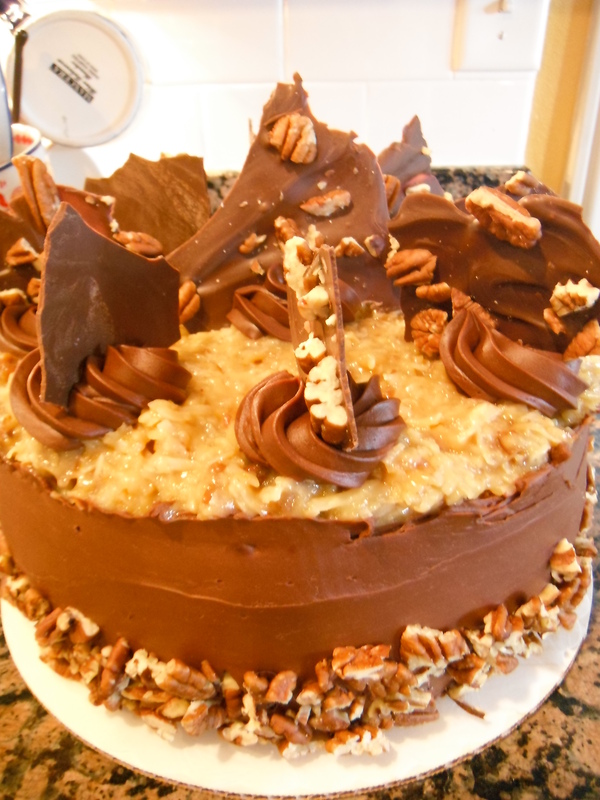 Over medium high heat whisk constantly until chocolate is melted and the mixture is thickened and bubbly. Turn down heat and continue to cook and whisk for 2 minutes. Temper the beaten egg yolks with 1 cup hot chocolate mixture and whisk into the chocolate mixture in saucepan. Cook an additional 2 minutes. Remove from heat and stir in vanilla. Pour into pre baked crust, set aside. Meanwhile make the filling. Combine the egg, evaporated milk, sugar and butter in a saucepan and whisk over medium heat until thick and bubbly. Remove from heat and stir in nuts and coconut. Spread over the top of the filled pie shell and allow to cool. Place on refrigerator for several hours to firm before serving. 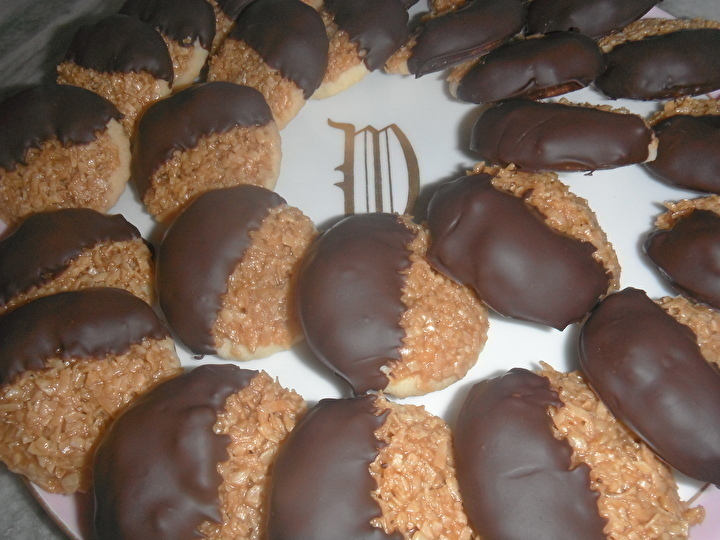 Chocolate Dipped Coconut Caramel Cookies-Yummy goodness!! In a large mixing bowl , cream together butter and sugar. On low speed blend in the remaining ingredients for the cookie base. On a lightly floured surface, roll dough out to 1/4 inch thick. Using a 2 inch round cookie cutter, cut out cookies and place on parchment lined baking sheet. Bake for 10 minutes or until edges just begin to brown. Allow to cool completely. For the topping, combine the caramels, salt and cream. Heat in microwave until melted together. Stir every so often. When caramel mixture is melted, stir in the toasted coconut. Place about 2 tsp. of the coconut mixture on top of each cookie and spread on the top. Allow to cool completely. When topped cookies are cool, melt the chocolate and dip 1/2 of each cookie in the chocolate and place on parchment lined baking sheet. 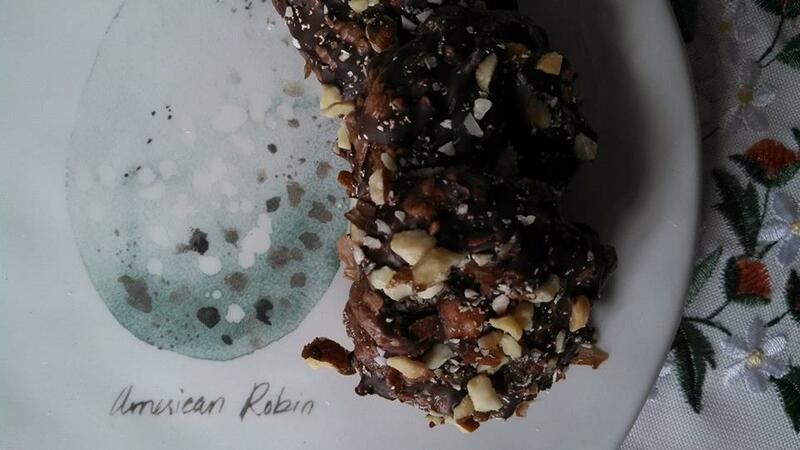 Set aside to cool and chocolate to set.